BIG VEE A.K.A. BLOCKBOSS BIGVEE is Oaklands newest hard pusher of the music the fans all know and love. 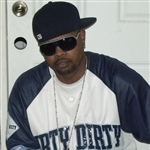 You can check out his interviews in Based Magazine also August 2009 Featured Artist of the month in Itz Official Ya Dig Magazine. BLOCKBOSS BIGVEE started his Record Label[BLOCKBOSS ENTERTAINMENT™ LLC] in August of 2009 and has since released two full length mixtapes all the while building the BLOCKBOSS brand. Through social networking sites, numerous shows and word of mouth, BLOCKBOSS BIGVEE has built a web of loyal supporters and a very strong network...independently. Since a young boy, it was apparent that entertainment was his life's calling. This prodigy of the Oakland streets took street knowledge and combined it with intelligence to create a map to success by means of hard work, Public relations and Solid music. BLOCKBOSS BIGVEE was always known for his ability to arrange words in such a way that your interest is never lost. The ability to paint a picture that a listener can see by just listening is what sets this Artist apart from the other "rappers", he is truly a poet as well. BLOCKBOSS BIGVEE is always hitting the streets with new music taking it directly to the fans. He has done shows with some of the greats such as the legendary Slick Rick and Oakland's own Too Short, plus many shows with up and coming Artists from around the country. The latest mixtape titled: SUPERSTAR STATUS has features from New Orleans,LA Cleveland,OH Bronx,NY Richmond,CA and those collaborations were acheived by means of networking on social media sites by the man himself with no help. His work ethic is 100% business, he is never afraid to meet new people and bring them into his network. For that reason, this Artist is destined to be one of the greats. It is his goal to reunite the west coast DJs with the west coast Artists once again and take music out of the hands of the corporations and give it back to the people.